Pocket Survival Kits are kits that are designed to increase your chances of survival during a crisis or survival situation. The Pocket Survival Kit is the smallest variants of survival kits and the most important aspect of the kit is that it could be light and small enough to be carried at all times. The Pocket Survival Kit is also a natural component for large survival kits like the Bug Out Bag (BOB) and Get Home Bag (GHB). How much items your kit should have depends and what items that you should carry depends on your personal setting and climate but a small kit with a few items that you always carry is better than a large kit that you never carry. 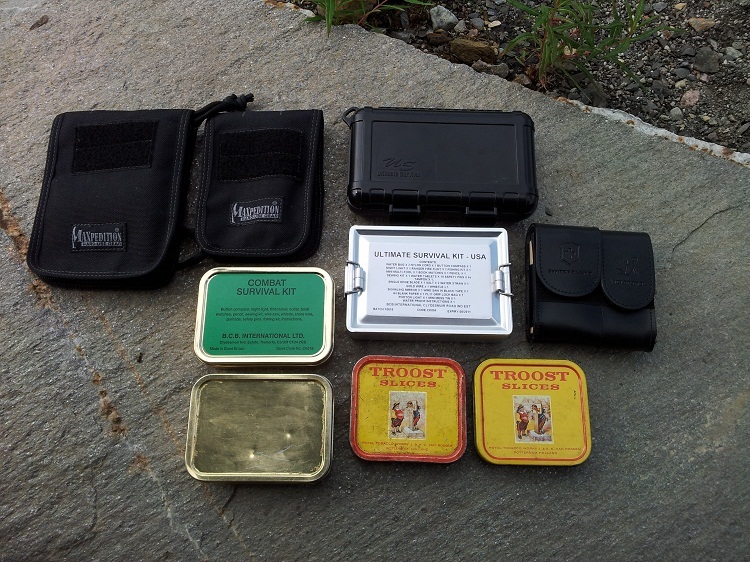 A metal or plastic tin are the most common containers for a pocket survival kit. Other solutions could be a nylon pocket like the pockets made by Maxpedition or a neck wallet. If you have enough space the smallest wide mouth bottles by Nalgene makes good container that also can be used as a water container in an emergency and are extremely hard to break. You don’t have to carry all items in one container; you could divide the different items between containers so that you carry a few on your person, some in your backpack or jacket etc. The hard small hard case from Pelican is another option that you can check out. There is basically no limit on how much money you can spend on a survival kit. A survival kit is just like a knife, there isn’t any survival kit that’s perfect for all tasks and situations. You can get a preassembled kit for around 20 dollars or build your own using items from your home almost for free. Make or buy a kit that’s good for your personal situation and needs. If possible visit a store and check different kits out before you make up your mind. I will give some advice about what items that can go into a Pocket Survival Kit and recommend some items from different companies; however this is only a fraction of the high quality products that can be found on the market. You can often find some of the items cheap on E-Bay, a yard sale, a garage sale or as military surplus. • I suggest that you carry at least two items in your kit that can be used to start a Fire. Matches are one of the easiest items to start a fire with. There are many kind of matches, if you have enough space in your container BCB and Proforce makes special long burning waterproof matches that comes in waterproof containers that’s very good. A lighter is also a very good tool to start a fire with; you can get a simple BIC lighter for a few dollars or a more expensive high quality storm lighter. The most compact type of lighters from BIC, the mini lighters take up very little space in a kit. A Fire Steel is another good item to start a fire with; however I suggest that you learn how to use it before you put it in your kit. One of the best fire steels you can get comes from Light My Fire, they sell replacement fire steels for their SL3 knife, this fire steel consists of on the steel itself, and it has no handle so it takes up very little space in a survival kit. ESEE also makes a very compact fire steel thats perfect for small kits. Ultimate Survival makes an excellent fire steel that’s called BlastMatch that can be operated with one hand. The only downside with this product is that it has a high price and takes up much space in a kit; it won’t fit in small tin. A Magnifying glass is another tool that can be used to start fire with. A piece of tinder like the Wetfire from UST can also be a good addition to start fire in an emergency. A razor blade or small knife is an excellent item to carry in a pocket survival kit. If you’re going for a small folding knife examples of knives could be the Spyderco Lady Bug, Victorinox Classic SD, Fällkniven U-4 and TK-4 or the Gerber LST / Gerber Ultra LST. A P-38 Can Opener is a compact tool that can also be used for other tasks like a improvised screw driver, cut fishing line, gut fish or as a box cutter. • Small LED lamps are also common items to carry in a survival kit, but they are also good items to carry on your keychain. The cheap models often work rather well, if you’re looking for a high quality model I suggest that you check out the models from Fenix and 4Sevens that uses AAA batteries. The small Petzl E+Lite are an excellent headlamp that small enough to fit in most survival kits if you only bring the lamp and not the plastic cover. Small Candles is often used in survival kits as a light and a tool to start fires. If you’re looking for a light source I recommend that you go with and LED lamp instead. • Wire saws are a compact saw that uses a wire with small teeth that can be used to cut through wood or bone. They can be a good addition but remember that even the high quality models are not that strong and can easily be broken. • Snare Wire is also a common item that can be used to make snares to catch small animals but can also be used for other tasks like improvised shoes laces or fishing line. Brass wire is most commonly used. • Pen and Paper are also good items that can help you remember important events in case of an emergency. A simple small pen like the ones you can get for free at IKEA will be enough for most situations, if you’re looking for a more high quality model you can check out the pens from Fischer Space Pen like the compact model Bullet and the Stowaway Space Pen. Rite In The Rain makes some really good Notebooks, the papers from these Notebooks is excellent for a survival kit. • Condoms can be used as improvised water containers, you can make it last better if your fill it with water and put inside a sock. Heavy duty food grade plastic bag is also a good alternative. The bags called aLOKSAK is extremely strong zip lock bags that I strongly recommend, especially for a survival kit. • Whistles are excellent tools for signaling for help during an emergency. There are many model, the low cost models that comes with most preassembled kit are quite good. However there is even better whistles that can be bough such as the JetScream from Ultimate Survival Technologies and the Survival Whistle and Mountain Whistle from Lifesystem. Klättermusen uses small whistles that they attach to the zippers on their jackets that can be bought in some stores that sell outdoor equipment. These whistles take up very little space in a survival kit, however I recommend that you get one of these and attach it to the zipper on your jacket so that it’s always with you. • Signal Mirrors are an excellent way to signal for help during an emergency. There are many models that can be bought, The Starflash from Ultimate Survival Technologies, the Mayday Signal Mirror from BCB and the Emergency Signal Mirror from ESEE are some examples. • Sewing Kits can be used to repair cloths, tents, packs and other things if they brake. Bring some sewing needles, make sure to bring one or more or the larger variant with sharp edges that used to sew in heavy duty material such as leather. Bring strong thread, I recommend the extra strong thread from Gütterman. Dental floss is a very strong thread that can be used as an alternative to normal thread. A Suture set is an alternative or a good complement to normal sewing kit. • Salt is an item that’s cheap and good to have in a survival kit. I suggest that you either take some salt and put it in a small zip lock bag or take one the small salt bags that you can find at takeout restaurants. • A Button Compass is a good tool for navigation in a survival situation. The only downside is that most small compasses have a tendency to brake after a while, even the high quality models. There are models that can be attached to your watch band and carried with you at all times like The Suunto Clipper and the Silva Carabiner 40. • A Fishing Kit consisting of some fishing line, hooks and weights is also a common item in a survival kit. I suggest that that you buy high quality monofilament fishing line and strap it around a small piece of plastic. If you’re going to bring a fishing kit learn how to make a fishing knot. A miniature wobbler / swimbait with a weigh can be used to catch fish in rivers. Fly’s thats used for fly fishing is also a good item for survival kits. • Safety Pins can be used for many things, everything from keeping a broken jacket together, securing band aids or as fishing hook. • Water Purification Tablets are a important items that allow you to disinfect water in order to prevent infections. Pain killers are good item to carry if you get wounded or get a fewer. Anti diarrhea tablets can help to prevent the loss of fluid and energy if you get sick. It’s best if you can store them in a waterproof tube or small zip lock bag. • Small plasters is good for small cuts, Sutures can be used to close larger wounds. I suggest that you bring a couple in your survival kit. A disinfection wipe can be stored in the kit and used to sterilize a wound. • 550 Paracord can be used to make straps to important items in your kit like fire steel, knife, compass or whistle. In an emergency it’s good if you can make a take a bit of paracord, attach the most important items and carry them east accessible around the neck. You can wrap paracord around your container but this will make it harder to reach items in case of an emergency. The Paracord normally have between seven and nine yarns inside the protective other shell that can be used for sewing, fishing line etc. Paracord is often used to make bracelets so that it can be carried along at all times. • Duct Tape can be wrapped around an old credit card or a piece of cardboard and be used for emergency repair, to secure band aids and many other uses. There are many preassembled kits on the market that can be bought. BCB has a Pocket Survival Kit called the “Combat Survival Kit” that’s based on John Wisemans kit from the “SAS Survival Handbook”. This kit is rather cheap and the kit is a good start. However some of the items have a low quality. There is small knife in the kit that I suggest that you get rid of and replace with razor blade or a small high quality folding knife. 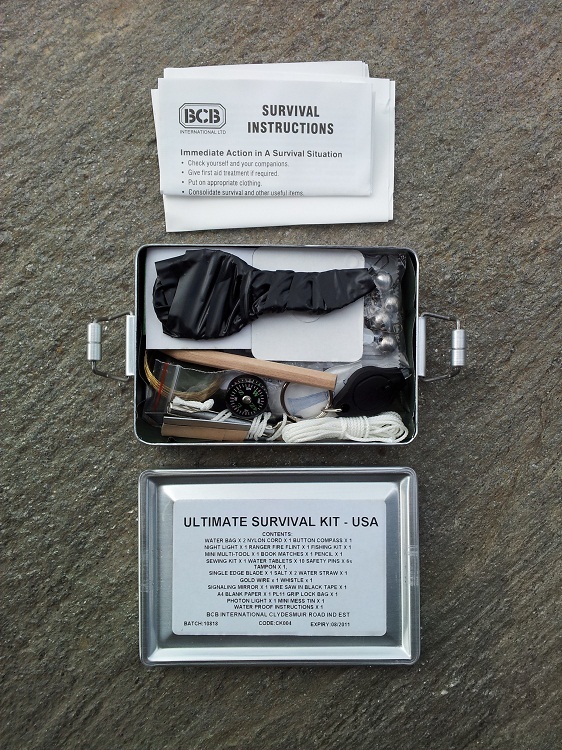 BCB also have other models like the Ultimate Survival Kit. This kit is basically the same kit as the one mentioned above, only it comes in a larger container with a lid that can be better secured and some additional items. This kit is much more expensive than the standard kit, I suggest that you buy only the larger tin that can be bought separately and a standard kit and complement the rest of the items yourself if you’re considering this solution. Proforce also makes a similar kit to the Combat Survival Kit made by BCB. Victorinox has a special survival kit that holds some survival items and a Swiss Champ. This kit is made out of leather and can be carried at your belt. The kit contains some items like a small flashlight from Maglite, Sharpener, Compass, Matches, Fishing kit, Pen and paper to name a few. The kit has a high quality but also a high price and weight. The Pro Survival Kit Company makes a number of high quality Survival Kits and Survival Tools. The company uses a large number of items from different companies. They also sell a belt that can be used to store items concealed. TOP Knives makes a survival kit that comes in the shape of a neck wallet. The wallet contains a number of items like sharpener, P-38 can opener, screwdriver, whistle, signal mirror and razor blade. You can check out their kit on the company homepage. Rat Cutlery / ESEE Knives makes a number of small survival kits, one of the kits comes in a small nylon bag that can be attached to your belt. Another kit from ESEE is the compact Wallet E&E Kit. They also make some other interesting items for kits like the Titanium Escape and Evasion Mini Blade, Survival Card and AH-1 Arrowhead. Ultimate Survival Technologies (UST) makes some really outstanding survival equipment. The major problem with their equipment is that it’s expensive and often rather heavy. The sell the Deluxe Survival Kit that comes in heavy duty plastic container but it only contains fire steel, whistle, tinder and a saw. This Kit has very few items but the items all have an outstanding quality. They also sell a more comprehensive kit called the Soldiers Tactical Advantage Kit. Gerber has also started to produce Survival Kits together with the survival expert Bear Grylls. They produce two kits: the “Ultimate Kit” and the "Basic Kit”. A good Folding Knife, Swiss Army Knife or Multi Tool makes an excellent complement to a Pocket Survival Kit. A waterproof watch is also a good complement that’s good for Every Day Carry. There are excellent credit card sized tools that you can carry in your wallet at all times, the tools in these cards are small but the offer the possibility to always have some essential tools with you. Tool Logic makes a number of different cards, some with compass, fire steel and a small knife, Victorinox makes a model called Swiss Card. A Cell phone is a good tool that allows you to contact other in case of an emergency; there are some models that also have other useful features like GPS, Compass, Flashlight and FM/AM radio. Carrying a kit at all times gives you some options if you would encounter a survival or crisis situation but can also serve as tool kit to help you deal with everyday problems. The items are however of little use if you can’t use them. Training, Skills and Experience, Physical Fitness and Health is more important than the gear you carry. Wow these are really compact and helpful. I think all of us should have one in our car as you never know when you may need it. Great write up on the basics that are required for constructing a basic survival Kit. It is true that you can pack a lot of punch into a small package if you need to. I really like the Bear Grylls Survival Kit and think it provides a nice alternative to some of the other BCB ones etc. A pocket survival kit that really could save your life! The Pocket Survival Pak™ contains a collection of survival tools for when you find yourself abandoned, stranded, or lost in the outdoors. Keep these survival aids in your pocket and on your person because, "If it isn't with you, it can't save you." Some excellent survival kits here. One thing I would strongly recommend for anyone looking to create their own personalized survival kit is to include an excellent knife sharpening kit that is both effective and small/portable. I would recommend checking out the DMT website as these guys have a great selection of knife sharpening kits to meet the needs of nearly anyone. Awesome, thank you for this! Good to see a wide range of survival kits showcased. If you haven't already, check out Gareth for his awesome range of survival knives! Your blog article is really very nice about Survival Kits.Thanks for sharing this information and I hope you will share some more info for the beneficial of our info. Wonderful post. I am happy that I found your post while searching for awesome news and idea. Thanks! It is very useful and interesting website.